Olde English Bulldogges are sturdy, muscular and big-boned — yet, somewhat nimble and athletic. Their powerful, bulky heads have broad muzzles and furrowed brows. Their ears can be perky or hanging. They have thick, powerful necks and stocky legs — creating a somewhat “cobby” body. Old English Bulldogges have short, coarse coats that can come in white with patches of red, gray and brindle; or solid colors of fawn, red, black or black & white. You can help reduce shedding and keep your olde english bulldogge clean with brushing. Inspect for fleas and ticks every day during warm weather. Many olde english bulldogges don’t need to be bathed more than a few times during the year. 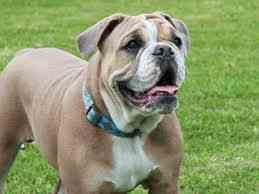 Before bathing, cut out or comb all mats from the olde english bulldogge’s coat. Rinse all soap out of the coat, or the dirt will stick to the soap residue. Olde English Bulldogges should visit the vet for a thorough assessment, vaccinations and a heartworm blood test annualy, and immediately if he/she is ill or hurt.